Looking at the key topic of inflation, and the labor market, the Fed found that U.S. labor market is "near or a little beyond" full employment in early 2018, and that while the pace of wage growth has been modest, "serious labor shortages'' would probably give it an upward push. Ironically, and paradoxically for an "economy beyond full employment", the Fed observes that "the pace of wage gains has been moderate; while wage gains have likely been held down by the sluggish pace of productivity growth in recent years." Regardless, the Fed clearly is concerned about labor supply-demand imbalances, and has even added a new word: serious, as in "serious labor shortages would probably bring about larger increases than have been observed thus far." In a separate special section on financial stability, the Fed notes that overall vulnerabilities in the U.S. financial system remain moderate, while noting some spots where things are warming up. These include signs of increased leverage to the nonbank sector, noting greater provision of margin credit to equity investors such as hedge funds. Looking at financial imbalances, the Fed warns that "leverage in the nonfinancial business sector has remained high, and net issuance of risky debt has climbed in recent months. In contrast, leverage in the household sector has remained at a relatively low level, and household debt in recent years has expanded only about in line with nominal income." The Fed also cautions about the record leverage we recently noted in the hedge fund world, as follows: "There are signs that nonbank financial leverage has been increasing in some areas --for example, in the provision of margin credit to equity investors such as hedge funds. Vulnerabilities from nonfinancial leverage are judged to be moderate." A close look at low inflation worldwide finds a lot of it is explained by resource slack and commodity prices, while for the U.S., movements in the dollar also play a role. "The economic assessments in the Fed report are largely consistent with the tone of recent public comments and the minutes from the last meeting. Policy makers have an eye on financial stability risks, but do not view them to be substantial at the moment, instead characterizing them as "moderate." As we noted in response to the January FOMC meeting minutes, Fed members are hewing to a Phillips-Curve type of framework in thinking about inflation. So a key driver of the Fed reaction function will be the tenor of wage pressures, which appear to be mounting in an extremely gradual fashion at the moment." Curiously, before Powell's remarks were dropped, both Dudley and Rosengren were on the tape this morning talking super dovish about QE as "useful to have in the toolkit for those times when the short-term interest rate tool may not be available," adding that The Fed is “quite likely” to require large-scale asset purchases again because real rates will remain low due to slow productivity and labor-force growth. And adding that "if LSAPs are indeed not effective, then the Fed may need to take other measures." Furthermore, they attempted to calm market fears by claiming that balance-sheet normalization “has been non-disruptive” unlike the 2013 bond market taper tantrum. 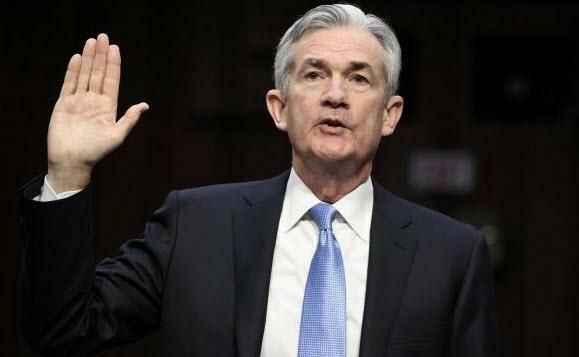 The 55-page report, released days before Chairman Jerome Powell delivers his first semi-annual testimony before House and Senate committees, reprised recent economic data and the Fed’s policy actions. Powell will preside over his first meeting of the Federal Open Market Committee as chairman on March 20-21. "How tight is the labor market? Although there is no way to know with precision, the labor market appears to be near or a little beyond full employment at present. The unemployment rate is somewhat below most estimates of its longer-run normal rate, and the labor force participation rate is relatively close to many estimates of its trend." "Job growth remains consistent with further strengthening in the labor market ... the pace of wage gains has been moderate; while wage gains have likely been held down by the sluggish pace of productivity growth in recent years, serious labor shortages would probably bring about larger increases than have been observed thus far." "Although employers report having more difficulties finding qualified workers, hiring continues apace, and serious labor shortages would likely have brought about larger wage increases than have been evident to date." "It is possible that labor shortages have arisen in certain pockets of the economy, which could be an early indication of bottlenecks that are not yet readily apparent in the aggregate labor market. However, even at the industry level it is difficult to see much evidence of emerging supply constraints." "Vulnerabilities in the U.S. financial system are judged to be moderate on balance. Valuation pressures continue to be elevated across a range of asset classes even after taking into account the current level of Treasury yields and the expectation that the reduction in corporate tax rates should generate an increase in after-tax earnings." "There are signs that nonbank financial leverage has been increasing in some areas --for example, in the provision of margin credit to equity investors such as hedge funds. Vulnerabilities from nonfinancial leverage are judged to be moderate." "Leverage in the nonfinancial business sector remains high, with net issuance of risky debt climbing in recent months. However, the share of the lowest-quality debt in total issuance declined, and relatively low interest expenses mitigated some of the vulnerabilities associated with elevated leverage." "U.S. banks are well capitalized and have significant liquidity buffers." "In a sign of increasing valuation pressures in commercial real estate markets, net operating income relative to property values (referred to as capitalization rates) have been declining relative to Treasury yields of comparable maturity for multifamily and industrial properties." "Some major emerging market economies harbor more pronounced vulnerabilities, reflecting one or more of the following: substantial corporate leverage, fiscal concerns, or excessive reliance on foreign funding." "Inflation has generally come in below central banks’ targets in the advanced economies for several years now. Resource slack and commodity prices -- as well as, for the United States, movements in the U.S. dollar -- appear to explain inflation’s behavior fairly well. But our understanding is imperfect, and other, possibly more persistent, factors may be at work."